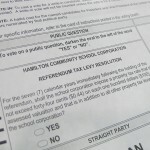 Four of seven school-related ballot measures passed during Tuesday’s municipal elections, a much larger proportion than Indiana normally sees in November polls. Trends persisted as Hoosiers in only seven districts saw referenda on their local tickets. But voters bucked the norm by approving more than half of those measures. Typically, researchers say, referenda have a better chance of passing in May, since pro-referenda voters aren’t the majority of those who turn out for fall ballots boasting big races such as mayoral contests or city council races. Indiana lawmakers implemented property tax reform in 2008, which resulted in a smaller portion of tax revenue distribution to school corporations. That’s why local school corporations tend to turn more to voters now to help foot the bill for construction and other projects. Including Tuesday night’s results, just over half of the 128 school-related measures brought forth in Indiana since 2008 have passed. Check out our referenda scorecard to see how voters weighed in on those measures.